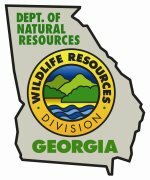 Serving Metro Atlanta, Bremen, Carrollton, College Park, Columbus, Fayetteville, Franklin, Grantville, Greenville, Griffin, Hogansville, Jonesboro, La Grange, Lovejoy, McDonough, Newnan, Peachtree City, Riverdale, Union City, West Point, and surrounding cities. Call (678)340-3269 to schedule an appointment. Yates and Pedersen (1982) list seven North American species of moles. They are the eastern mole (Scalopus aquaticus), hairy-tailed mole (Parascalops breweri), star-nosed mole (Condylura cristata), broad-footed mole (Scapanus latimanus), Townsend’s mole (Scapanus townsendii), coast mole (Scapanus orarius), and shrew mole (Neurotrichus gibbsii). The mole discussed here is usually referred to as the eastern mole (Scalopus aquaticus). It is an insectivore, not a rodent, and is related to shrews and bats. True moles may be distinguished from meadow mice (voles), shrews, or pocket gophers—with which they are often confused—by noting certain characteristics. They have a hairless, pointed snout extending nearly ½ inch (1.3 cm) in front of the mouth opening. The small eyes and the opening of the ear canal are concealed in the fur; there are no external ears. The forefeet are very large and broad, with palms wider than they are long. The toes are webbed to the base of the claws, which are broad and depressed. The hind feet are small and narrow, with slender, sharp claws. Out of the seven species that occur in North America, three inhabit lands east of the Rocky Mountains (Yates and Pedersen 1982). The eastern mole is the most common. The star-nosed mole is most common in northeastern United States and southeastern Canada, sharing much of the same range as the hairy-tailed mole. The remaining four species are found west of the Rocky Mountains. The Townsend mole and the coast mole are distributed in the extreme northwest corner of the United States and southwest Canada. The broad-footed mole is found in southern Oregon and throughout the coastal region of California excluding the Baja peninsula. Finally, the shrew mole is also found along the West Coast from Santa Cruz County, California, to southern British Columbia (Yates and Pedersen 1982). The mole lives in the seclusion of underground burrows, coming to the surface only rarely, and then often by accident. Researchers believe that the mole is a loner. On several occasions two or even three moles have been trapped at the same spot, but that does not necessarily mean they had been living together in a particular burrow. Networks of runways made independently occasionally join otherwise separate burrows. Because of their food requirements, moles must cover a larger amount of area than do most animals that live underground. The home range of a male mole is thought to be almost 20 times that of a male plains pocket gopher. Three to five moles per acre (7 to 12 per ha) is considered a high population for most areas in the Great Plains. Deep runways lead from the mole’s den to its hunting grounds. The denning area proper consists of irregular chambers here and there connected with the deep runways. The runways follow a course from 5 to 8 inches (12.7 to 20.3 cm) beneath the surface of the ground. The chambers from which these runs radiate are about the size of a quart jar. Most of a mole’s runway system is made up of shallow tunnels ranging over its hunting ground. These tunnels may not be used again or they may be re-traversed at irregular intervals. Eventually, they become filled by the settling soil, especially after heavy showers. In some cases, moles push soil they have excavated from their deep runways into the shallow tunnels. These subterranean hunting paths are about 1 1/4 to 1 1/2 inches (3.2 to 3.8 cm) in diameter. Moles usually ridge up the surface of the soil, so their tunnels can be readily followed. In wet weather, runways are very shallow; during a dry period they range somewhat deeper, following the course of earthworms. Moles make their home burrows in high, dry spots, but they prefer to hunt in soil that is shaded, cool, moist, and populated by worms and grubs. This preference accounts for the mole’s attraction to lawns and parks. In neglected orchards and natural woodlands, moles work undisturbed. The ground can be infiltrated with runways. Moles commonly make their denning areas under portions of large trees, buildings, or sidewalks. The maze of passages that thread the soil provides protective cover and traffic for several species of small mammals. Voles (meadow mice), white-footed mice, and house mice live in and move through mole runways, helping themselves to grains, seeds, and tubers. The mole, however, often gets blamed for damaging these plants. Moles “swim” through soil, often near the ground surface, in their search for worms, insects, and other foods. In doing so, they may damage plants by disrupting their roots. The teeth of a mole indicate the characteristics of its food and general behavior. In several respects moles are much more closely related to carnivorous or flesh-eating mammals than to rodents. The mole’s diet consists mainly of the insects, grubs, and worms it finds in the soil. Moles are thought to damage roots and tubers by feeding on them, but rodents usually are to blame. Moles eat from 70% to 100% of their weight each day. A mole’s appetite seems to be insatiable. Experiments with captive moles show that they will usually eat voraciously as long as they are supplied with food to their liking. The tremendous amount of energy expended in plowing through soil requires a correspondingly large amount of food to supply that energy. Moles must have this food at frequent intervals. Moles prefer loose, moist soil abounding in grubs and earthworms. They are most commonly found in fields and woods shaded by vegetation, and are not able to maintain existence in hard, compact, semiarid soil. The mole is not a social animal. Moles do not hibernate but are more or less active at all seasons of the year. They are busiest finding and storing foods during rainy periods in summer. The gestation period of moles is approximately 42 days. Three to five young are born, mainly in March and early April. The moles have only a few natural enemies because of their secluded life underground. Coyotes, dogs, badgers, and skunks dig out a few of them, and occasionally a cat, hawk, or owl surprises one above ground. Spring floods are probably the greatest danger facing adult moles and their young. Moles remove many damaging insects and grubs from lawns and gardens. However, their burrowing habits disfigure lawns and parks, destroy flower beds, tear up the roots of grasses, and create havoc in small garden plots. 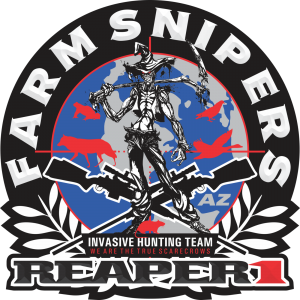 It is important to properly identify the kind of animal causing damage before setting out to control the damage. Moles and pocket gophers are often found in the same location and their damage is often confused. Control methods differ for the two species. Moles leave volcano-shaped hills that are often made up of clods of soil. 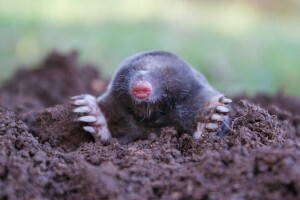 The mole hills are pushed up from the deep tunnels and may be 2 to 24 inches (5 to 60 cm) tall. 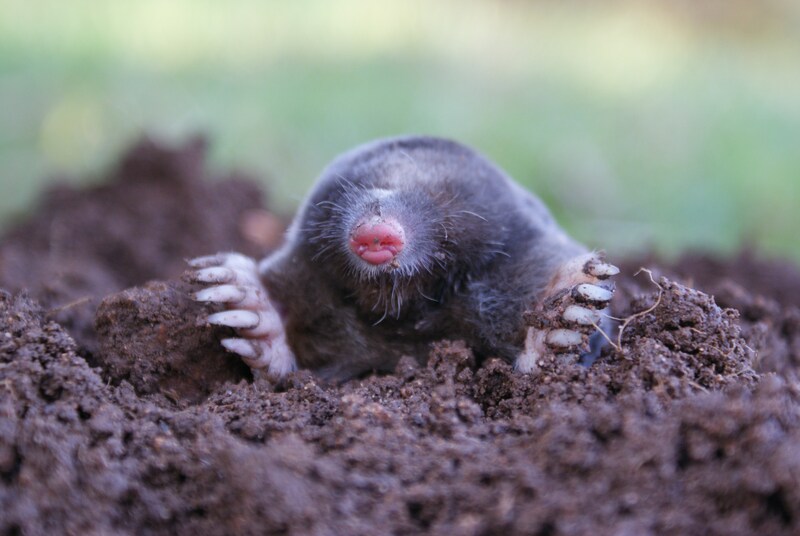 The number of mole hills is not a measure of the number of moles in a given area. Surface tunnels or ridges are indicative of mole activity. Pocket gopher mounds are generally kidney-shaped and made of finely sifted and cloddy soil. Generally, gophers leave larger mounds than moles do. Gopher mounds are often built in a line, indicative of a deeper tunnel system.